Newsbytes: Polar Bear Population Growing Despite Declining Sea Ice | Watts Up With That? Great News! But Where Is The News Coverage? ← "Sorry, a TIME Magazine Cover Did Not Predict a Coming Ice Age"… It was just a TIME article. Must be plenty of seals then. There is tons of news coverage. What does the study say about the value of K longterm? As far as I remember, North Magnetic Pole is moving same direction-East Canada and further in Russian tundra. Sorcerers and witches, huh? Funny, that. Nowadays it’s deniers and republicans. I have yet to find a global warmist prediction or claim which isn’t either misleading, flat out wrong, or 180 degrees wrong. Practically every global warmist is a brainless liar. Doesn’t matter what the real numbers are. The agenda is what matters and reports will be made to support it whether they are true or not. An otherwise intelligent scientist and self-proclaimed skeptic, Phil Plait, is so bought-into the meme that he can’t evaluate this kind of data (see http://www.slate.com/blogs/bad_astronomy/2013/06/11/climate_change_denial_zombies_ams_president_marshall_shepherd_talks_global.html for example). It’s both pitiful and funny at the same time. Maybe not despite, but rather because of declining Sea Ice? Does that mean “America’s” Polar Bear populations no longer requires protected status? That’s if the very few around Alaska actually constitute a “population”! Humppff! Rent seekers the flaming lot of them! Were? If you supply 15 unique links to stories in popular literature you might prove your point. Otherwise your just blowing smoke. The only reason I was aware of this study is that I follow the literature. Carnivore biology is one of my areas of study. BTW, I bet you don’t know how K is calculated for carnivores. You obviously don’t know what it means. or how it is used. You showed this by asking such a stupid question in an attempt to distract and confuse while trying to look as if you know something. You really are a one trick pony, just like the rest of your fellow travelers. Certain contrarian commenters here are fond of dropping cryptic statements and questions, but not so hot at supporting them with data. Information content = 0. It’s one the questions suggested by the authors. You wouldn’t know it from Anthony’s summary, but the authors actually said that the current depression in growth rate is probably a result of reaching capacity OR declining sea ice. Also, that billboard he posted is pure garbage. I tend to discount Polar Bear studies of the Hudson Bay sub populations for a host of reasons, but this study is of the far more significant Davis Straight sub population. Obviously what your son saw wasn’t a “science center,” it was a branch office of the Ministry of Truth. OK, maybe not flies, but like, well dead poley bears thrown from planes. @Ryan, one of the problems when assuming everyone else is stupid, is that is what you become. I need you to interpret this article ? As for tons of news coverage, of the amazing success of polar bears to adapt to a non problem. Climate doesn’t kill polar bears, guns do. 5 times more bears in 40 years since we stopped shooting them. Sounds like a good idea that worked. Kudos to those who got that one through. Think about what would happen to the bears if we kept shooting them but preserved their environment from melting (like we could if we wanted to anyway). Polar Bear Population Growing Despite Declining Sea Ice – and that’s not happening either! Concur. The best way to be a REAL CONSERVATIONIST is to become as efficient as possible, both with our energy use and our land use. That will do more to protect the wild critters and the trees more than any tree hugger plan. CAGW is scam to redistribute wealth and nothing more. If Gore touched it stinks. There are estimated to be more than 5 million harp seals off Eastern Canada … if you add to this the populations of ringed seal, hooded seal and bearded seal, then no wonder the bears are doing so good! Just the parts that the blogs are leaving out, as mentioned above. Data that sea ice is a factor in polar bear carrying capacity? Do you really doubt something so obviously true? Or is it the decline in sea ice that we doubt here? It’s so hard to keep track. My request was for Eustace to provide data for his claim that others are not providing data to support their claims which, oddly, he forgot to do. Since you brought up an curious Straw man argument that I might doubt that, ” sea ice is a factor in polar bear carrying capacity? 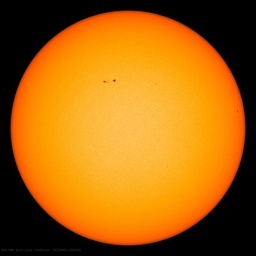 Do you really doubt something so obviously true?”, I’ll point out that there doesn’t appear to be a published optimum Sea ice amount for the optimum success rate for Polar Bears in harsh climates, such as the Arctic. Could there be too much Ice, as perhaps there is in such places as Antarctica? Polar Bears seems to have the highest life expectancy in warm zoos with little or no ice. Do you really doubt something so obviously true? That’s the warmist religion in a nutshell. Please concentrate, Ryan! Trolling is hard, and you might have to share your spot in the limelight with the competition. Should history repeat itself with a new mini ice age the media and public are also sure to repeat the cycle as well ? discus. what is the casue ? well there is all the pollution ! now thats a theme thats running even now . And who is to blame for that pollution? well we all know how the media loves pitch black steam pollution from cooling towers and this is in the good times ! So the answer is quite simple, industry will be blamed, the bigger, the more so, and with even better photoshops. Even if they have cleaned up their act the dwell time/delay curve will be used by the media as a sharp stick to poke them with as a way of expressing the populations pent up frustration, because “someone has to be blamed”, it does not make a good story if its just a natural change in the weather. The best form of defence is then surely attack, and with the science we now have through WUWT and all the other brilliant contributors to the game its time to turn the blame to the wamists for wasting so much time and effort that could otherwise have been spent preparing for the new minimum. Currently sea ice is at the baseline average, higher than the last several years. Maybe it’ll crash again this summer, forcing the Dear Polies to survive on berries and goslings, again. Actually, these are mythical polar bears, the real ones having gone extinct during one of the many previous warmer-than-now periods, especially during the Eemian interglacial, some 110-130k years ago. We know that polar bears survived an ice free Arctic. Here are some reasons why they have proved to be so resilient over the past 10,000 years. The analysis indicated that it is possible for polar bears to maintain their body mass while on shore by feeding on arctic charr and seal blubber. Polar bears of body masses up to 280 kg could gain sufficient energy from blueberries to match the daily energy loss. Analyses were made of 233 scats collected from islands in James Bay and 212 scats gathered on the southwest coast of Hudson Bay. Birds, primarily Anatidae, were the most commonly used summer and autumn food of bears in James Bay. Marine algae and grasses were the foods most often eaten by bears on the mainland…. Bears which fed in the dump were significantly heavier than those which did not. There was no evidence that bears using the dump gained either reproductive or survival advantages…. …We describe an observation of a polar bear cub on its mother’s back while the mother was swimming among ice floes in Svalbard, Norwegian Arctic. Similar observations are to our knowledge not earlier described in the scientific literature. We point out that this behaviour minimize exposure to cold water and hence significantly may reduce chilling of the cub…. Ryan, hang around on WUWT. You may become less ignorant on this subject. this could provide some fun fodder for trolling wiki. 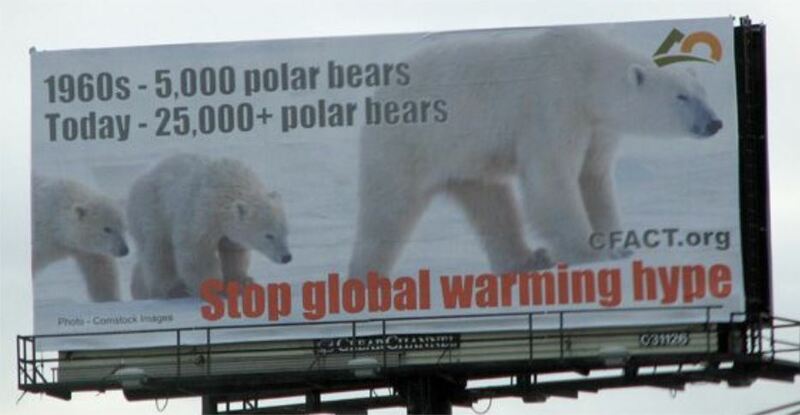 WWF banner images with polar bears seem to get shared a lot on social media. Maybe it goes both ways? If sea ice was contracting, it would mean that the polar bears have to go less distance to get a decent feed of seal steak. Also the density of seal steaks on the edge of the sea ice would increase. Feast time !! No more 200km trek to get a steak, Hog’s Breath is just round the corner. We need some polar bears down in New England, as the seals are becoming a royal pain. The only thing that eats seals now is Great White Sharks, which are becoming more common and also eat tourists. Therefore, if the bears ate a few tourists, it would be OK, because bears are much cuter. It’s a price we’ll have to pay to increase the stocks of codfish. (100,000 seals eating five codfish a day is 182.5 million codfish per year.) Seals aren’t so cute, when seafood is no longer affordable, and polar bears become cuter. I believe this to be true. Hunting seals on ice is a two dimensional problem. Hunting with no ice and you have linear shorelines as your hunting grounds – the seals need the ice, too, otherwise they would have to conduct their fishing and birthing activities on land. I’m not sure what CAGW proponents think the polar bear did during much hotter times in the Holocene and in warmer interglacials. They didn’t magically appear during the little ice age, for example, but rather are 600,000yrs old – and were brown bears before that. Hate to break this news to the bulk of alarmists and even to “experts”. Thanks JabbaTheCat. If anyone bothers to read the paper you find that polar bears appear to be ‘managed’. ‘Harvesting’ is allowed if populations are thought to require it for a variety of reasons. God save the polar bears from conservationists. Oh, I forgot, the conservationists also pull a tooth from every polar bear they capture. So if you hear a polar bear with a lisp it’s been ‘researched’by a conservationist. More likely no HUNTING allowed. Humans are the main predators of Polar bears. Also bears are feeding at human dumps and even invading cabins/houses. There are some who still don’t get it. Their imagination is greater and more supreme than truth. Did you not read any of those links and abstracts which Jimbo posted, above? None of those studies pierced your bubble? I know someone posted this before.. but what the heck. ”Yes” said the daddy polar bear, “you are”. and the baby polar bear said……….. Thank heavens for this. I heard somewhere credible that polar bears were driven into prostitution by ACW. More on polar bears – study also showed good body mass presently although in a previous period of INCREASING ice and increasing polar bear population, the body massed declined probably due to competition for available food. The main food source for PB’s is around the very edge of the ice. If sea ice expands the PB’s have to travel much further to get a feed. All polar bear populations increased from the 1970s, because that was when international regulations on polar bear hunting were enacted. This is clear from the literature, and nothing to do with climate change. Like land glaciers, it appears that most, but not all, populations are in decline or at risk. A proper analysis of polar bear population would include all data available. The data for the Peacock study comes from 2005 – 2007 (per their abstract). They point out that reproductive rates have declined, possibly as a result of sea ice changes. Commensurate with previous reports, this suggests that, because of lower reproductive rates, that community is at risk, along with others. Some populations do not seem to be at risk at this time. That argument cuts both ways: climate change had nothing to do with the past polar bear decline, either, which was due to hunting [Polar bear skins have doubled in price over the past 3 years]. the point is that the article omits information like the things you mention, and thus is spurious. Data should be investigated properly, or it is misleading. Clearly, hunting prior to the 70s was the primary cause of polar bear decline, and regulations the primary cause of population increase. That should not be confused with climate change effects, as is the case regarding the top article. You have absolutely no proof that ‘climate change’ [which always happens] has any effect on PB populations, and you sound ridiculous even implying it. I provided evidence of the reason for the decline and recovery of the PB population, while you emit your opinion — which stems from your climate alarmism. Polar bears are not dying off due to climate change. dbstealey, I was not trying to ‘prove’ anything, just pointing out the deficiencies in the article. I’ll take it you accept my point, seeing as you have not contended it. Your article says warmer temperatures are responsible for polar bear deaths. Not sure it corroborates your point. The following institution is the foremost authority on polar bear populations (repository of studies, research and observations, ongoing). If you know of another resource that is as comprehensive, I will check it out and add it to my bookmarks. barry, it is hard to respect your point of view when you take this article seriously. FYI, it was a comic parody of your polar bear nonsense.